The traditional cruises will go Vancouver to Anchorage or Vancouver to Vancouver and they do some great sightseeing of Glacier Bay National Park or perhaps Hubbard Glacier, and then they typically stop at a mix of towns including Juneau, Skagway, Ketchikan and Sitka. These towns are tiny (think Akaroa) and you step off the boat right in the little town. The boats have 1,000 – 3,000 passengers and you could have 2-4 boats in one town on one day so they do get crowded with tourists. The towns are full of souvenir shops catering to the cruise passengers – you will find the shops repeated in each town, so chances are you will be looking for other experiences. So… think about the Alaskan experience you are looking for and pre-book excursions so you can really experience the area. If you can, include at least one fixed wing or helicopter flight – these are truly amazing and not too expensive and the views are utterly breathtaking. 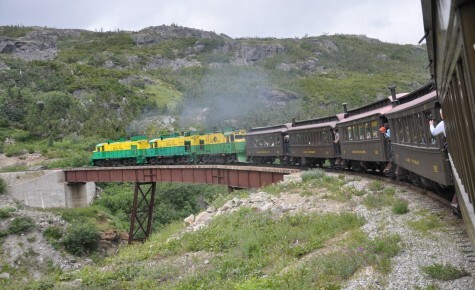 • White Pass & Yukon Railway is a fantastic tour and I highly recommend it. Really interesting and good scenery. It departs about 100 metres from where the boat docks and the cruise line will manage this excursion really well. • You could also do a great flight out of here as well. • Do the Mt Roberts tramway to the top of the mountain – great views. • The town itself is built on poles so interesting to stroll around and sea salmon in the water below. Lumberjack show is fun. • They have a good Raptor centre so you can see bald eagles. • Great wildlife viewing here – most popular is the Sea Otter & Wildlife Quest tour. • Plus you can see Bears at the Fortress of the Bear wildlife viewing. May 21 – Sept 15.